This weekend’s kitty blogging is brought to you by Big Cat Rescue. The news this week was BCR’s rescue of three tigers from a sanctuary in New York where they were starving to death. The unfortunate part was that it took years for the state to close the place down despite repeated citations for mistreatment of the animals. It would seem that the New York sanctuary probably started out with good intentions but underestimated the effort and cost of caring for the big animals. But then, and this seems so insane to me, they fought getting their animals placed in a safe environment where they could be cared for properly. Big Cat Rescue cares for about 100 rescued cats at any given time. They say it costs $10,000 per cat per year to feed and house them. You can read about how to donate or sponsor a cat on their website. Their mission also includes educating the public on abuse issues and activities that you may not realize leads to abuse as well as legislation to prevent taking big cats (particularly kittens) as pets. I need to make a will (we all should, you know) and I think I will leave my small estate to Big Cat Rescue if my parents die before me. They also have a YouTube channel where you can get more information or stay abreast of the issues. Big cats are a lot like domestic cats in many ways. Watch them play with catnip and toys – but one thing you won’t see there is the volunteers playing with them or wrestling them like you do with some organizations. The cats are still dangerous and are not pets. Far too many educational programs make the big cats look like pets – it’s no wonder that many of us sort of want one as a pet, even though we know it’s a bad idea. Or like their FaceBook Page. It includes some additional fun stuff like the flow chart below. So true of my cats. Zoe decided this week to get up on the counter and try to get a paper towel that smelled like hot dogs out of a plastic grocery bag. She ended up with her head stuck through one of the handles and freaked out, running around like a crazy cat and ending up under the bed. Fortunately, the bag broke loose just before that. My fault for not throwing it away immediately. Why do people have to be so stupid about big cats? I know they are adorable as babies, but STILL. I’m glad to read about this organization. Our family visited a big cat sanctuary(smaller one) when coming through Spokane on a road trip. We’ve also made several visits to Wolf Haven which does the same for wolves. It’s that adorableness as babies that causes most of the problem, indirectly. It’s the people who are willing to pay to get their picture taken with the babies and the advertisers who use the babies and the other stupid reasons that the lions and tigers are bred only to have the kittens end up in tiny cages and roadside attractions a few weeks later. And most of those people don’t realize that they’re contributing to the problem, they just think the babies are cute. The worst are the white tigers who are so over-bred that most of the kittens are badly malformed. Of course, I didn’t know most of this until I ran into the BCR site a few years ago. We need more education. We need those animal experts on talk shows to talk about these issues, not just show the cute babies. We need – something – that ends the need for these sanctuaries. People mistreat animals in the weirdest ways, don’t they? 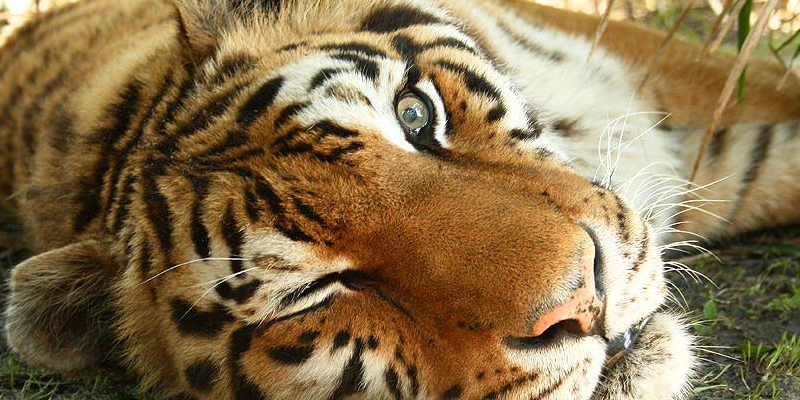 This rescue group sounds like they have the right resources and smarts to help those big cats. Still, so stupid that anyone even started the chain of events that led to this. I think they mostly do, though I was a little disappointed when they called for a “polite” request to a radio station that was posing with baby tigers from a local zoo. BCR called the zoo notorious without any substantiation and I’ve only found one other site that claims this zoo is buying babies and then getting rid of them. Knowing what is right and real is hard. And the internet quickly becomes a mob when these types of requests are made and mobs are usually not the right thing.